I can still see the veil of foggy mist off in the distance and hear the rumble of the obese tanker truck as it slowly crept down our street seeking out its prey. I remember Mom yelling from the house to get inside and my friends scurrying away so as not to become covered with the dewy mix that was a nightly summer occurrence. Thinking all safe after the commotion passed, we would return to our innocent games on grass laden with freshly sprayed pesticide. It was called Mosquito Abatement. The funny thing was that there never seemed to be a shortage of mosquitoes. The year was 1964; the city was Houston. It was during this period of my childhood that my pet Boxer, bitten by a mosquito he couldn't protect himself from, worked himself into a frenzy as my Mother sprayed him with toxic flea repellent he couldn't escape. One day he just fell down never to rise. Last summer we were told that one of our dogs had heartworms, a fairly new occurrence in our area brought by the mosquito. Fortunately, there are courses of treatment and preventative measures now, and our furry friend will be OK. It is no wonder, though, that the mosquito is a hated foe. You are probably wondering what this has to do with plants. It has been more than a decade since the introduction of the so called Mosquito Plant. Anxious to arm themselves with whatever ammo might be available, consumers were more than ready to be told that there was a magic plant that, if just placed on the patio, would make our tiny winged enemy, the mosquito, turn and run. The plant was supposed to have been engineered by a Norwegian scientist, a Dr. So and So with a very impressive sounding name, and it was introduced by a well known and "respectable" plant purveyor. A member of the Scented Geranium family, this plant was called the Citrosa Geranium, after Citronella oil. It showed up as the mosquito plant in supermarkets, high end catalog companies and was even on the home shopping network. The prices were high, but the promise of no more mosquitoes was a powerful marketing tool and the plants flew off the shelves. It didn't take long for someone to start scrutinizing this plant and what they found was, at the time, really shocking. Not only was there no famous scientist, there was so little Citronella oil in the plant that even crushing it and rubbing it on the skin would do little to protect someone from the dreaded mosquito. Organic Gardening Magazine reported that Lemon Thyme had a much higher concentration of the needed chemical, Citronellol, and we all know that Lemon Thyme coexists peacefully with mosquitoes playing all around. So what about the Citrosa Geranium? 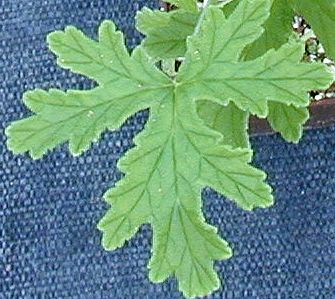 A large leaved, pink flowering Scented Geranium with a fragrance more like lemons than citronella, Citrosa Geranium grows robustly and is a perfect choice for hot dry spots in the garden or for large containers on the patio. Just don't expect the mosquitoes to be too impressed.